Sri Ramanujacharya, the well-known exponent of Sri Vaishnavism and Visishtadvaitam, was born in Sriperumbudur, near Chennai, in 1017 A.D. to a pious and virtuous couple, Keasava Perumal Somayaji Dikshitar and Kanthimathi ammal. He was named Ilaya Perumal by his parents. Within sixteen years of age he had learnt the Vedas and Sastras. At the age of seventeen he married Rakshakambal. Soon after his marriage his father died and the family moved over to Kanchipuram. There he enrolled himself in the school run by an Advaitic Sanyasi Yadavaprakasa to prosecute further study of Vedas. On many occasions he differed with guru’s interpretations. On one occasion Yadavaprakasa became so angry that he asked Ilaya Perumal to leave the school and start his own, if he felt so strongly about his interpretation. Ilaya Perumal parted company with Yadavaprakasa and started a small school where he taught his Visishtadvaita philosophy and became popular. Seeing the growing popularity of Ilaya Perumal and his philosophy, Yadavaprakasa feared he will be a threat to his school and spread of Advaita philosophy. So he planned to kill Ilaya Perumal by drowning him in River Ganges while on a pilgrimage tour of the country with his disciples. He invited Ilaya Perumal to join him and his disciples in the pilgrimage tour. Unsuspectingly Ilaya Perumal agreed and joined the pilgrimage along with his cousin, Govinda. On the way Govinda came to know of Yadavaprakasa’s plot from some of the disciples and alerted Ilaya Perumal, who then slipped out of the group into the forest at dead of night. He was lost in the forest but miraculously an aged hunter couple appeared from nowhere and led him as if in a trance to the outskirts of Kanchipuram and disappeared. As the couple disappeared as suddenly as they appeared, he realized it was none other than Lord Varadaraja and Perundevi Thayar who had come in the guise of the hunter couple to guide him. Feeling thankful to the Lord he continued his routine in Kanchipuram, assisting Tirukkachi Nambi in his daily chores of service to Lord Varadaraja and also running the school, as if nothing had happened. When Yadavaprakasa returned, he was surprised to see Ilaya Perumal working as before and did not interfere in his life. Rather he became Sri Ramanuja’s disciple at a later date and was given the name Govinda Jeer. Yamunacharya, a great sage and profound scholar and head of the Mutt at Srirangam, had once met Ilaya Perumal and was very much impressed by him and secretly desired Ilaya Perumal should succeed him as head of the Srirangam Mutt. So when Yamunacharya fell ill he sent word to Ilaya Perumal. As Ilaya Perumal and Tirukkachi Nambi arrived in Srirangam, they could see the funeral procession only. Ilaya Perumal was told of three wishes that Yamunacharya wanted Ilaya Perumal to carry out. They were; 1) to write a commentary to Brahmasutra on Visishtadvaita lines; 2) to spread Visishtadvaita on the lines of Nalayira Divya Prabandham; 3) to perpetuate the memory of Parasara and Vedavyasa. Ilaya Perumal swore to carry out all the three wishes on the funeral pyre of Yamunacharya and returned to Kanchipuram. Ilaya Perumal’s married life was not a happy one as there was a regular clash of views with his ultra orthodox wife on what was holy and sacred and on what was religiously correct. Matters came to a head one day when he was aged thirty and he walked out of the house and took Sanyasa with the name “Ramanuja Muni”. The inmates of the monastery in Kanchipuram made Sri Ramanuja their head. Dasarathi, his nephew became the first disciple of Sri Ramanuja with the name Mudaliandan. Another important disciple to join him at Kanchipuram was Kuresar, also known as Kurathalwan. The seat of Acharya at Srirangam was lying vacant without a successor to take over. Sri Ramanuja was prevailed upon to assume charge. So Sri Ramanuja left for Srirangam along with Mudaliandan and Kurathalwan and a host of disciples and devotees. At Srirangam Lord Ranganatha Himself invited Sri Ramanuja into the temple by calling him “come on my son, Udayavare". From then on Sri Ramanuja came to be called also as Udayavar. After installation as the head of Visishtadvaita Mutt at Srirangam, Sri Ramanujacharya proceeded to Thirukkoshtiyur to take initiation from Thirukkoshtiyur Nambi for Japa of the sacred Mantra of eight letters “Om Namo Narayanaya”. Somehow, Nambi was not willing to initiate him easily. Nambi made him travel many times before initiating him and that too only after exacting solemn promises of secrecy. But Sri Ramanujacharya wanted all to benefit from this Mantra and so climbed up to the top of the steeple of the temple and called out aloud to people and proclaimed to the large assemblage the sacred Mantra. Thirukkoshtiyur Nambi was enraged and demanded an explanation. Sri Ramanujacharya gave the reason that though he would go to hell for breaking the secrecy, the multitude of humanity that listened to this would be saved spiritually. The Guru was overwhelmed by this reply. 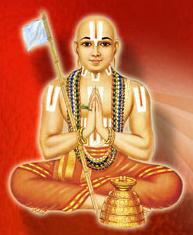 Embracing Sri Ramanujacharya and appreciating his broad mindedness, he called him 'Emperumanar'. But this routine was disturbed when the Chola king Kulothunga I, a staunch Saivite. wanted him to subscribe to king’s faith. When ordered to king’s court, two of his disciples, Kurathalwan and Peria Nambi, donned the orange robes of Sannyasins and visited the court of Kulothunga I in place of Sri Ramanujacharya. They argued there for the superiority of Lord Vishnu, when asked to accept the superiority of Lord Siva. The monarch was incensed and had their eyes put out and subjected them to torture. Peria Nambi succumbed to the torture, but Kurathalwan survived and managed to get back to Srirangam blind. Meanwhile, Sri Ramanujacharya, with a few followers, left Srirangam and proceeded with difficulty to Melkote in the kingdom of Mysore. The king of the place was Bhatti Deva of the Hoysala dynasty. The king’s daughter was possessed of some devil and nobody was able to cure her. Sri Ramanujacharya succeeded in exorcizing the devil and the princess was restored to her former health. The king was very much pleased with him and readily became his disciple and converted himself into a Vaishnavite. Thereafter Sri Ramanujacharya firmly established himself in the Mysore king's dominions, constructed a temple at Melkote, and created a strong Vaishnavite community there. He constructed a few more Vishnu temples in and about Mysore, and put them in charge of his disciples to continue his work and spread the Visishtadvaita philosophy and Vishnu worship throughout the king's dominions. Thus he continued his labours here for nearly twenty years and his followers numbered several thousands. In the meantime, Kulothunga Chola 1, died and the successor to Kulothunga Chola I was not a religious bigot and allowed full freedom of worship. The followers of Sri Ramanujacharya in Srirangam communicated the news to Acharya and requested him to come back to Srirangam. Sri Ramanujacharya himself longed to go back to Srirangam and continue his work from there. But his new disciples and followers at Melkote and other places in Mysore would not let him go. So he installed his own image in a temple for worship by his disciples and followers and left the place for Srirangam. He was welcomed by his friends and disciples at Srirangam and he continued his labours from there for another thirty years and ended his long active career attaining Paramapadam at the ripe old age of hundred and twenty. Stated briefly, Sri Ramanujacharya’s philosophy is Visishtadvaita philosophy. Here Parmathma, Jeevathmas and Jagat , all three are Real as they form a whole with Jagat and Jeevathmas being part of Paramathma as His body. Jagat and Jeevathmas inhere in Paramathma as attributes to a substance. Lord Vishnu is the Paramathma. He is the life of all Jeevathmas as individual Jeevathma is the life of individual Jeeva. Jeevathmas are of three types; Nitya, eternally free, Muktha, free now but once were in Samsara and Baddha, in Samsara and not free. Jeevathmas retain their identity even after Moksha and live in Fellowship with Paramathma, either serving Him or meditating on Him. Moksha is attained through liquidation of one’s karmas as spelt out in Vedas achieved through total devotion to Lord Vishnu, characterised by Saranagathi. Vaishnavism as expounded by Sri Ramanujacharya is called Sri Vaishnavism because of the special importance given to the worship of Goddess Laksmi as the mediator between Jeevathma and Paramathma.